Former seaport where Robert Burns lived before his death in 1796. House contains personal possessions. 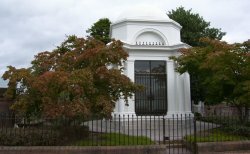 Robert Burns Centre recalls his years in Dumfries and his mausoleum is in St Michael's Churchyard. Mid Steeple was built in 1707 as courthouse and prison. Bridge dating from 15th century is oldest of five across River Nith, and 18th-century windmill contains camera obscura and local history museum. Old Dumfries. Dumfries Angel. Tranquillity abounds along the beautiful Nith and its neighbouring valleys, hemmed in by the gentle Galloway Hills and the Solway Firth. The Firth brings a soothing climate to an area where passions once raged, both the fierce passion of clan battles, and the romantic passion of ballad poets. Immortalised in stone are St John the Baptist's chair and the Twelve Apostles. Rhododendrons, azaleas and camellias in formal and water gardens with Torbay-like climate. John Paul Jones's Cottage was 1747 birthplace of United States' first naval commander. Pebble beaches become acres of sand at low tide. Smugglers built 18th-century Balcary House, hotel 2 miles south-east of Auchencairn village to store contraband. Foot-path beyond bay through woods, farmland and rocky shore leads to spectacular cliffs. Guided tours show day-to-day life on stock-rearing hill farm set in rolling countryside. Museum and art gallery in elegant Georgian mansion with sheltered gardens on River Dee. Library has 15,000 books and manuscripts. Although the present castle is only of 16th Century origin, it is built on the site of a much older structure where the ancient Celtic Lords of Galloway had their seat. In 1282 the heiress, Devorgilla, wife of the Norman noble John de Baliol, signed the charter to found Balliol College from the original castle. John de Baliol, known as "Toom Tabard" (empty coat) to his subjects when he became a vassal king of Scotland, was born here in 1249. Two and a half miles north of Buittle Place is the 80 feet Mott of Urr, a well-preserved Saxon or early Norman artificial mound within a fortified enclosure. Located near Dalbeattie. The chief seat of the Maxwell family, and one of the foremost examples of medieval secular architecture in Scotland. It is famous in history and literature through its siege by Edward I in 1300, commemorated in the well-known old French poem, Le Siege de Karlaverok. In 1640 it was captured by the Covenanters and dismantled. The ruins, which stand within a wide moat, include much work of the thirteenth and fifteenth centuries; and the latest building, dating from 1638, is one of the finest examples of early classical Renaissance in Scotland. The shape of the castle is very remarkable, being triangular, like a shield, "with a round tower at each of the two basal angles and a great gatehouse at the apex. Located seven miles south-south-east of Dumfries on the Glencaple road. Caerlaverock Castle. Facade of tall standing stones flanks entrance of larger of two Stone Age burial mounds 200yds apart dating from 3000 BC. This very well preserved 15th century tower house still has original stairway and vaulted basement. Cardoness Castle. Bronze Age crannogs (artificial islands) among islets of Carling walk Loch on southern edge of 18th century weaving and carpet-making centre. Main street has steeple-like clock tower. Old Castle Douglas. At head of Cauldside Burn are Bronze Age remains of two cairns, two stone circles and large carved stone block. Larger circle, 70ft across, has ten standing stones. Forest walks start from outskirts of silvery-grey granite town in rolling countryside. The building is oblong on plan, three storeys high with a garret storey in the roof, all served by a wheel or spiral stair in a projecting square stair tower or wing: a good example of a Scottish tower house of about the middle of the sixteenth century. It is simple and severe; has a slightly overhanging parapet wall supported on projecting corbels. The gables of the typical saddle-backed roof are set back from the parapet wall. Located four and half miles north-east of Dalbeattie, west of the Dumfries road. Pink-sandstone stately home, 17th century, has art collection as well as personal possessions of Bonnie Prince Charlie. Wooded parkland overlooks upper Nithsdale and old stables now house visitor and craft centre. Handsome and substantial ruin, founded 1142, where Mary, Queen of Scots spent last night in Scotland, 1568. Murdered bishop and his assassin among many fine memorials. Dukes of Queensberry mausoleum in 17th century Durisdeer Church. Monument to second duke (died. 1711) and his duchess (died. 1709) has them reclining beneath columns and flying cherubs. Farmhouse, built by Robert Burns when he took farm over in 1788, contains museum room. The Granary houses display showing Burns as farmer. Riverside walk. Burns wrote Tam o'Shanter here. Footpaths and marked walks through oak, ash, beech and sycamore woods. Former cotton town is now walking and holiday centre on banks of Water of Fleet. Original gatehouse now houses whitewashed wine bar and Bobbin Mill Visitor Centre displays local history and recalls 18th century prosperity as cotton town. Old Gatehouse of Fleet. Village, once smugglers' haunt, now sailing resort, home of Solway Yacht Club. Houses are mixture of old fishermen's cottages and modern bungalows and villas. Low-tide walk from pebble beach to Rough Island bird sanctuary, home of waders, scaups, shelducks and mergansers. Jubilee Path has views to distant Galloway mountains. Unusual domed parish church of well-kept village has 1826 sundial telling times in such places as Madras, Calcutta and Gibraltar. Font presented by United States Navy in 1945 to honour its first naval commander John Paul Jones who was baptised here. Orderly estate village little changed since it was built in 1785, with 50 houses and number of craft workshops. Town dominated by St Cuthbert's Church spire, Gothic tower of Tolbooth (1411) and jagged top of 16th century MacLellan's Castle. Wooded Wildlife Park has eagle, snowy and barn owls. Old Kirkcudbright. Kirkcudbright Golf Breaks. Red sandstone remains of 12th century convent. Fine heraldic decorations. Knot garden has been restored. Lincluden College. A stone castle has existed on this site since 1330: it was in the hands of the English almost continuously between 1290 and 1385, enabling Annandale to be governed almost entirely as an English shire. At one time it was the great castle of the Bruces, Lords of Annandale, where some say the hero king was born and where he spent much of his youth. In those days it was a huge and powerful stronghold covering as much as fifteen acres and with four moats to defend it. It stood intact into the 17th Century, when it was left to fall into ruins. Located nine miles east of Dumfries. Views of Nithsdale and the Solway Firth can be seen from marked trails that lead through hillside plantations of fir, spruce, oak and beech. Restored 14th to 15th century house was once home of Annie Laurie, immortalised in Scottish ballad of same name written by her unsuccessful suitor, William Douglas, and later revised. In courtyard is museum of kitchen, dairy and farm implements. Excellently preserved Celtic hill-fort of 5th or 6th century, one of most important archaeological sites on Solway Firth. Good views of Cumbrian Hills. Most extensive motte-and-bailey castle in Scotland, dating from 12th century, and built on Saxon or early Norman mound. Grey stone riverside village with beautiful ruin of 13th-century Sweetheart Abbey, where Lady Devorgilla and embalmed heart of husband Johnde Baliol are buried. Scottish Baronial mansion, Shambellie House, contains costume museum with women's fashions from 18th century to Edwardian times. Water-powered corn mill, dating from 18th century, is in working order. Angling centre on River Ken has town hall with high clock tower and jougs, hinged iron collars in which malefactors were confined. Carved Adam and Eve stone stands in Kells churchyard. Round tower house, unique in Scotland, built by John Cairns in the 15th century. Spiral staircase, hidden within double walls, leads to parapet walk. Orchardton Tower. Village little changed since days as thriving inland port, with colour-washed houses around harbour, now silted up. Competitors use bare feet and spears to catch fish from mud flats in World Flounder Tramping Championships, off Glen Isle peninsula. Upper floors in two-storey houses were once lodgings for sailors. Ten mile forest drive beside Black Water of Dee, follows route taken by armed cattle thieves in SR. Crockett's 1894 novel The Raiders. Riverside and lochside picnic areas, walks and bronze otter statue. Open June-September. 20mph speed limit. The cross, which has been slightly restored, dates probably from the end of the seventh century. The main faces have figure-sculpture, mostly scriptural scenes, associated with Latin inscriptions, and on the sides are rich vine scrolls with birds and beasts. The quality of the sculpture is of the highest order. On the margins are inscribed, in runes, portions of the famous Old English poem The Dream of the Rood, which has been ascribed to Caedmon. Located in Ruthwell Church, half a mile north of the village and nine miles south-east of Dumfries. Village among attractive shallow hills has two boulevards lined with 100 year old lime trees planted by 6th Duke of Buccleuch. Tall column erected 1714 supports winged horse, emblem of Dukes of Queensberry. Old Thornhill. Estate surrounding Scottish Baronial Threave House has woodland walks and various gardens including display in spring of 200 daffodil varieties. Observation points overlook refuge along banks of River Dee with wild swans, ducks and geese. On island to north-west is mined Threave Castle, 14th century stronghold of feared Black Douglases. Battlemented and turreted bridge over River Dee, designed by Thomas Telford in 18OOs. Guided tours of hydroelectric power station and dam. Torthorwald Castle stands on a series of early medieval earthworks and was, from at least the mid-13th Century, a stronghold of the Kirkpatricks. In 1418 William de Carleil married the heiress and from then onwards the castle remained mainly in Carlyle hands until 1715. The present barrel-vaulted remains were built mainly by William, but in 1544 Lord Carlyle looted the castle, taking all its contents in a raid against his sister-in-law. Thirty years later, Michael Carlyle abducted the six-year-old heiress, Elizabeth Carlyle from the castle and for years traded her among rival branches of the family. Located four miles north-east of Dumfries, Scotland. Dated 2000 BC, largest diameter stone circle in Scotland.